This red shirt was the first shirt we ever saw Dean wearing. I think it looks quite nice on him. It’s a button down with one breast pocket on the left with no pocket flap. In the Pilot (1x01), Dean wears the red shirt for the first half of the episode, but changes out of it after he gets covered in mud. In Phantom Traveler (1x04), Dean wears it at the end of the episode when they say goodbye to Jerry and then listen to their dad’s voice mail message. In Bloody Mary (1x05), Dean wears it for their research trip to Fort Wayne and then through to the end of the confrontation with Mary. In Skin (1x06), Dean wears it to Becky’s house, while visiting the crime scene, and while reviewing the security tape with Sam. In Hookman (1x07), Dean wears it to the police station to get Sam out of jail, and then keeps it on until the end of the episode, except he momentarily takes it off while burning the bones. In Asylum (1x10), Dean is wearing it at the beginning of the episode in the motel, he then wears it to the bar to question the cop. In Faith (1x12), Dean wears it to the doctor’s after he is healed, and when talking to Roy. In Route 666 (1x13), Dean wears it to say goodbye (forever) to Cassie. 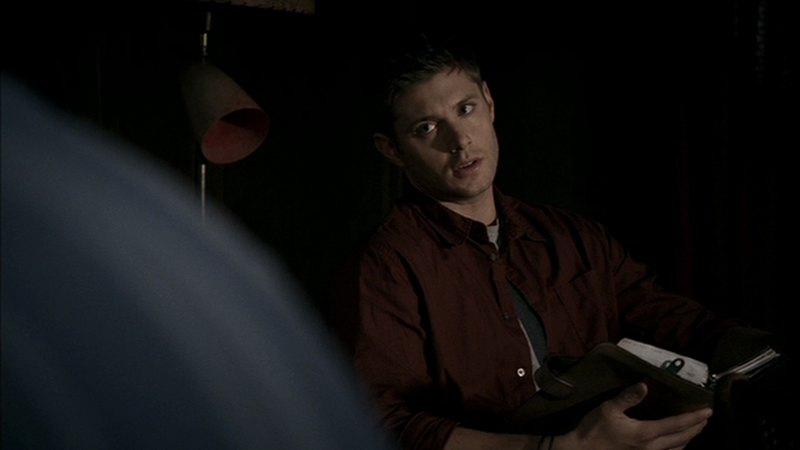 In Nightmare (1x14), Dean wears the red shirt as he and Sam pack up and leave the motel at the end of the episode. In The Purge (9x13), this shirt, or one extremely similar anyway, makes an unexpected return, as Dean wears it when he and Sam are interviewed for the trainer position at Canyon Valley Wellness Spa. In Twigs & Twine & Tasha Banes (12x20), Dean wears this shirt when they meet up with Alicia and Max. He continues to wear it for the rest of the episode. 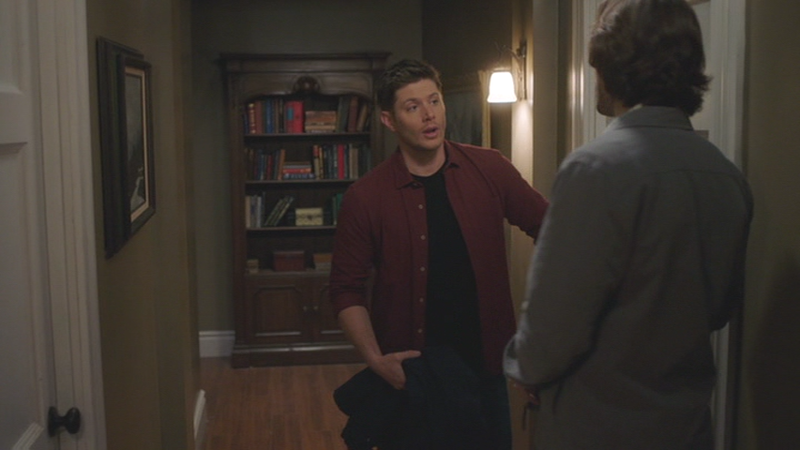 what is Dean wearing in season 2's No Exit? Is it a different shirt than this one? In No Exit, Dean was wearing his S2 Red Shirt - there are very subtle differences: Two breast pockets instead of one, with visible buttons on them. Ahh! thank you! I think Sam is wearing a red shirt at one point in S06, but I might be mistaken. I'm still working on my S05 photobook. Hi, what's the shape of the left shirt pocket? Re: Hi, what's the shape of the left shirt pocket? Hi, can you send me the picture of this Dean shirt I did not find her on Google? Hi, how are you? Send me the picture of the banana republic red dean shirt. Hi, how are you? Send me the picture of the banana republic red dean shirt. Right-click on the image. Select "save image as". Either red or dark brown, you'd have to watch the episodes to see if you can get a better look at them.